AUGEN LAW OFFICES – Local. Global. Attentive. Personal. A conditional permanent resident receives a green card valid for 2 years. In order to remain a permanent resident, a conditional permanent resident must file a petition to remove the condition during the 90 days before the card expires. The conditional card cannot be renewed. The conditions must be removed or you will lose your permanent resident status. To remove the conditions on a green card based on marriage, you must file Form I-751,Petition to Remove the Conditions of Residence. 1.What Is the Purpose of Form I-751? 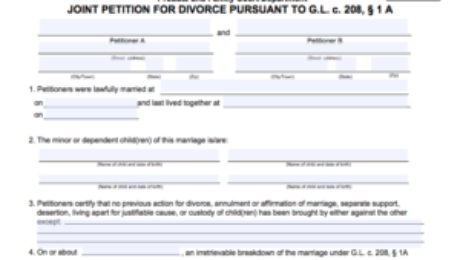 This petition is used by a conditional resident who obtained status through marriage, to request that U.S. Citizenship and Immigration Services (USCIS) remove the conditions on his or her residence. 2. Who May File Form I-751? 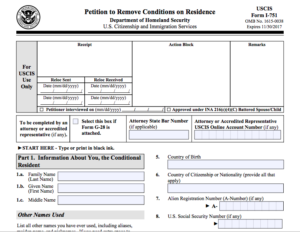 If you were granted conditional resident status through marriage to a U.S. citizen or lawful permanent resident, use Form I-751, Petition to Remove Conditions on Residence, to file for the removal of those conditions. 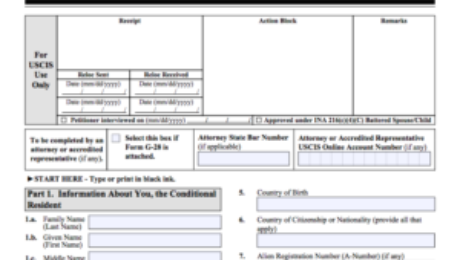 If you have dependent children who acquired conditional resident status on the same day as you or within 90 days thereafter, then include the names and Alien Registration Numbers (A-Numbers) of these children in Part 5. of Form I-751 in order to request that the conditions on their status be removed as well. If you have dependent children who did not acquire conditional resident status on the same day as you or within 90 days thereafter, or if the conditional resident parent is deceased, then those dependent children must each file Form I-751 separately to have the conditions on their status removed. The termination of your status and removal from the United States would result in extreme hardship. 3. How to Fill Out Form I-751. Please find the sections information listed in Form I-751 requested in Part1-11 as below. Part 4. Information About the U.S. Citizen or Lawful Permanent Resident Spouse. 4. At the time of filing, you must also submit “Initial Evidence”. If you have decided to end your marriage, you may choose to file for divorce. 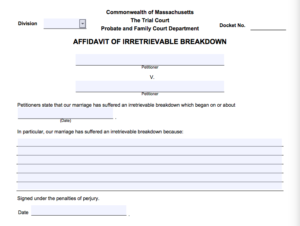 You can file for divorce in Massachusetts if you have lived in the state for one year, or if the reason the marriage ended happened in Massachusetts and you have lived in Massachusetts as a couple. 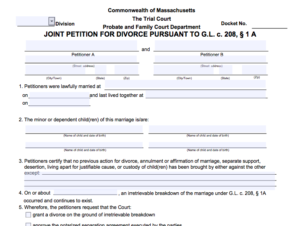 In Massachusetts, a divorce may be filed as “no-fault” or “fault,” and either of these can be contested or uncontested. Before you file, you must choose which type is right for you. “Contested” means that one person disagrees with the divorce or the terms of the divorce. “Uncontested” means that both people agree about everything they file. This process can be more time-consuming and expensive than a no-fault divorce. There are two kinds of “irretrievable breakdown” divorces. They are often referred to as “1A” and “1B”, referring to the section of the law under which they are found, Massachusetts General Laws Chapter 208. The most common approach is no-fault based on an irretrievable breakdown of the marriage. There are 2 options for a no-fault divorce. A “1A” divorce would be filed when both spouses agree that the marriage has irretrievably broken down and they have reached a written agreement with respect to child support, parenting time, alimony, child custody, and the division of marital assets. This is an uncontested no-fault divorce. (1) Joint petition for divorce under section 1A (CJD-101A) signed by both parties or their attorneys. (2) Joint affidavit of irretrievable breakdown signed by the parties. A “1B” divorce would be filed when one spouse believes there is an irretrievable breakdown of the marriage or both spouses believe the marriage has ended but they aren’t in agreement with regard to custody, support, or marital property issues. This is a contested no-fault divorce. If you and your spouse are able to come to an agreement, you can file a request to change the divorce complaint from a “1B” to a “1A”divorce. Please find the most important papers under “ 1B”: Complaint for divorce under section 1B (CJD-101B) signed by one party.